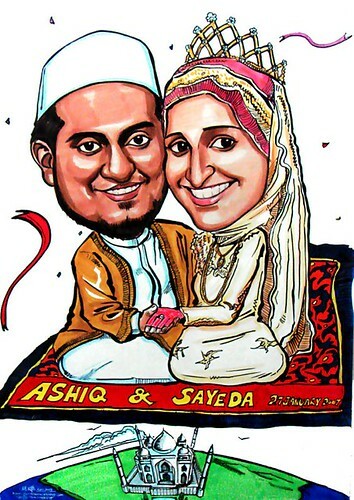 This website has been created for Muslim brides and bridegrooms in the process of planning their nikkah (weddings). There are tons of websites out there with a focus on weddings, but a perusal of these websites will show that the majority of them are not catered towards Muslim weddings. For instance, the wedding dress or gown designs show too much skin that are inappropriate for modest Muslim brides. Or the emphasis on extravagant weddings parties with music, dancing and free flow of liquor is not in keeping with Islamic rules or lifestyle. This presents a dilemma for Muslim brides and bridegrooms looking to plan a proper Islamic wedding, but one that is also memorable for themselves and their family and friends. Dob't worry - this is not an impossible task. Many have done it. And you can too. But I want to help by providing you, the reader, with ideas and tips on styles, designs and fashionable trends for your wedding day that is in keeping with Islam. Please take the time to read my articles and send me an email to tell me how I am doing!